Gem's Up North : What's in it for me...? * you ask? What's in it for me...? * you ask? What’s in it for you? should be the question; and lots and lots of goodness for your skin is the answer! The brand What’s in it for me...? are a beauty brand with skin care products for all. 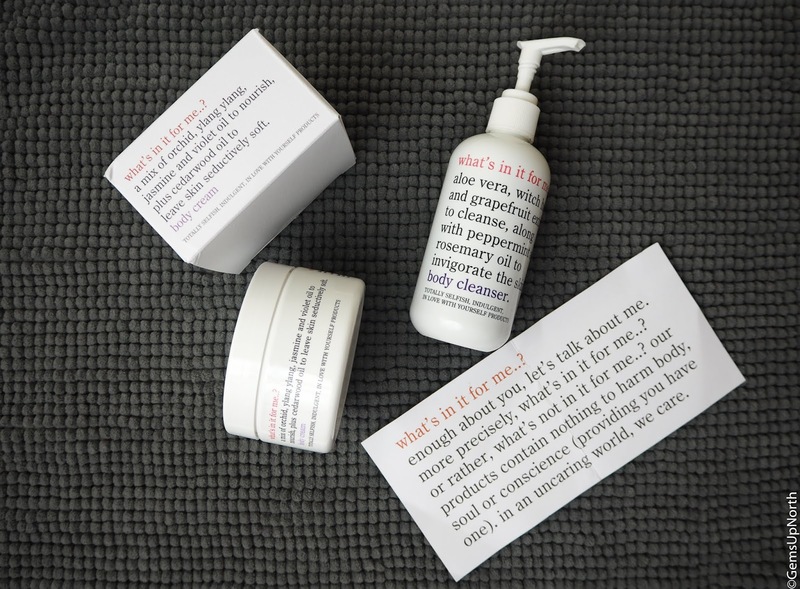 Each product is full of natural ingredients, nourishing properties and awesome scents! I was kindly sent two products from the brand to try out and I’ve been using them for around a month now so I thought I’d give you a guys a little review. What’s in it for me...? 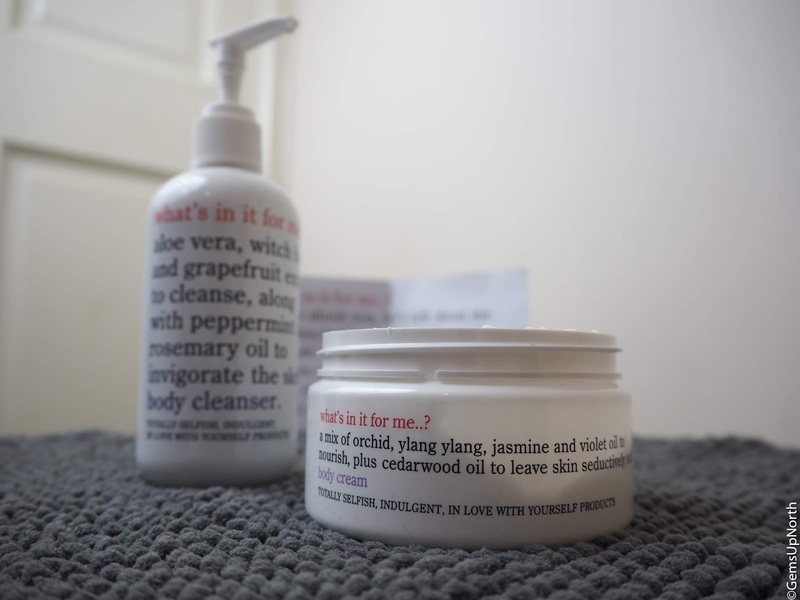 as a brand are focusing on you being more selfish and making time for yourself by creating products to help you relax, cleanse and nourish your skin. With products from body washes to hand cream to body cream, they've got a small collection of products just for you. Read more about the brands selfish products here. The two products I chose to try were both body care, first up the Body Cleanser* for in the shower and second the Body Cream* for afterwards. It’s been good to use them both together and I’ve had great results on my skin. 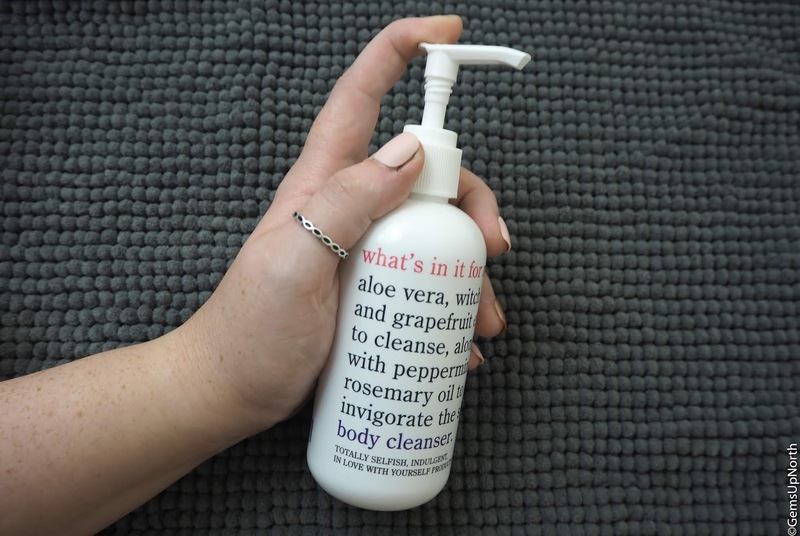 This body cleanser is just like a shower gel but with more nourishment in my opinion, the product can be lathered up on a shower puff or sponge or just applied straight to your body then rinsed off. It's easy to use and leaves my skin feeling clean, fresh and soft; with aloe vera, witch hazel and grapefruit extract which helps to clean the skin and keep it fresh feeling. Then the peppermint and rosemary oil help to nourish the skin all whilst smelling beautifully. All the ingredients make up a sweet scent which stays around for ages after showering, its like a perfect wake up call in the morning. The cleanser is clear in colour and smooths over your body at ease plus with the pump action lid I always feel I'm using less product so the bottle lasts for quite a while. I've been using this for around a month now and I've got around a third left in the bottle! To complete my What's init for me...? body care I've been using the body cream after showering to really soften my skin. This cream has a thinnish consistently but goes a long way when I apply, a couple of scoops cover my whole body and I smell great afterwards too! 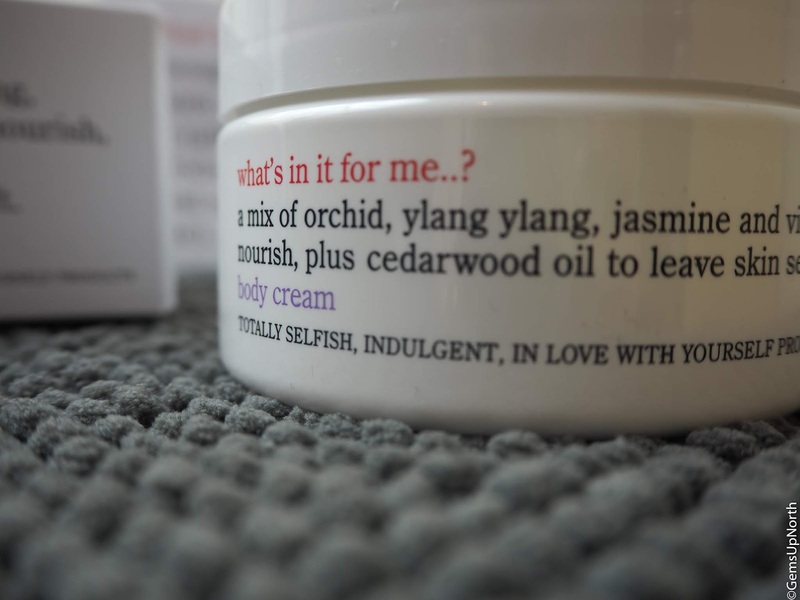 Inside the cream is a mix of orchid, ylang ylang, violet oil and jasmine which is a lovely combo for a body cream especially when you use in the evening time; I've found the scent to be very calming and settles me before bedtime. 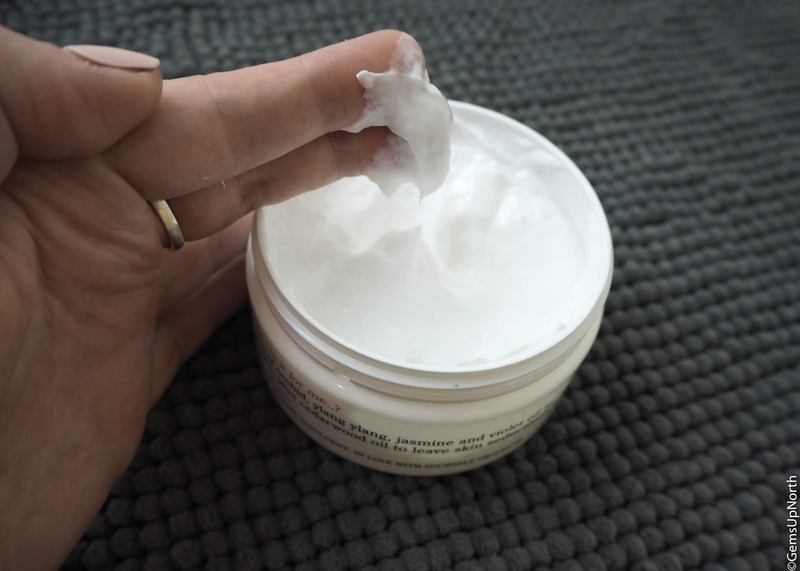 Cedarwood oil is also in the cream which helps to soften the skin, I can't smell the cedarwood but have had softer skin results after using the cream for a few weeks now. The cream can also be used straight after showering whilst the skin is still a little damp, this helps to seal in the moisture; honestly though I prefer to use it like a standard clean and apply onto dry skin but this may help someone with extremely dry skin. I think the brand has a simple design look but it’s everything it’s needs to be. I actually really like the look because the text is the feature on the products packaging and you can clearly see what the product is/does and what’s inside. I’d definitely pick up What’s in it for me...? in the future and continue to use these two items until they are fully empty. You can pick up What's init for me...? at Birchbox and Fragrance Direct and they are budget friendly prices too. What are you going to pick up? Tags: bbloggers, Beauty, beauty blogger, beauty review, Body Cleanser, Body Cream, fragrance direct, Gifted Items, Review, What's init for me...?